Campus Ministries helps students think about plans after college. Campus Ministries hosted a retreat for students to discuss vocations and their plans for their lives after college. This retreat, held at the College Cabin on Nov. 9, focused on three questions: What gives me joy? What am I good at? Who does the world need me to be? The retreat was aimed for juniors and seniors, those who are looking into their vocational future. This year, Campus Ministries sponsored the event. 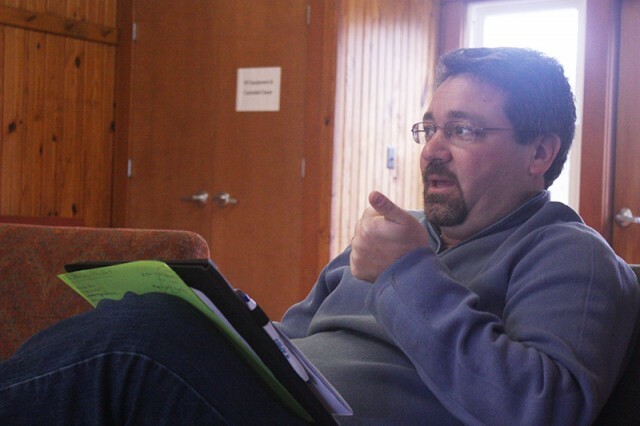 “Ultimately, [the retreat] was to help focus on how they will work at decision making and discernment after college, related to their vocation, related to life choices,” Bob Yoder, campus pastor and one of the leaders of the retreat, said. At 9 a.m., the students gathered to kick off the retreat. It began with a short video on the three questions, some personal reflection and journal time. Before lunch, there were small group discussions—all focusing on the three key questions. Lunch was a unique opportunity for the students who attended the retreat. Various Goshen College faculty members engaged in discussion with the students, describing their personal journey after college. The faculty members included: Richard Aguirre, Judy Weaver, Paul Kiem, Merrill Kraybill, Colleen Geier and Josh Keister. Originally, the idea for this retreat came from a model at Boston College. Although this year was the first retreat of this structure, Goshen College has been exploring these three key questions with students since 2012. In the past, the retreat has been held within small groups that met together to discuss about four times. Last year, there was hope to do a weekend retreat off campus, but it was financially unwise. So, this year, the retreat was held on campus for half a day. Yoder has hopes to make Life After College retreats happen once a semester. “I think it’s important to reflect on our future. It’s helpful for students to think about their vocation in the future and how they’re going to go about making decisions and discerning,” Yoder said.